Doctors , nurses, translators and interns who travel with us to our partner countries to provide training. Footprints Foundation is seeking an unpaid intern to work directly with Lorna Owens,CEO Footprints Foundation on it’s campaign to reduce Female Genital Mutilation in Somaliland. Footprints Foundation is a NGO located in Coral Gables. Footprints work to reduce Maternal and Infant Mortality in D.R.Congo, Jamaica and Florida City, USA. Somaliland is bordered by Ethiopia in the south and west, Djibouti in the northwest, the Gulf of Aden in the north, and the autonomousPuntland region of Somalia to the east. 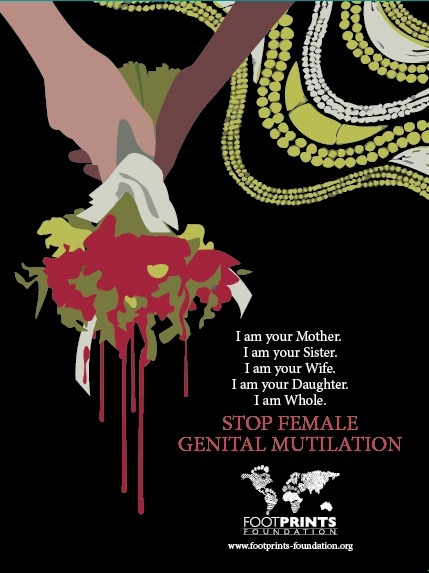 Female genital mutilation (FGM), also known as female genital cutting and female circumcision, is the ritual removal of the external female genitalia affecting over 127 million girls around the world. Footprints will be traveling to Somaliland in November and will meet with the local community in an effort to help the stop this century old practice. The intern chosen for this internship will do so for credit and will research this practice in Somaliland and Ethiopia- making comparison between the countries.Special attention must be paid to successful programs. Footprints will seek to interview these programs in both countries. Research is ongoing and will not be competed in anyone semester.